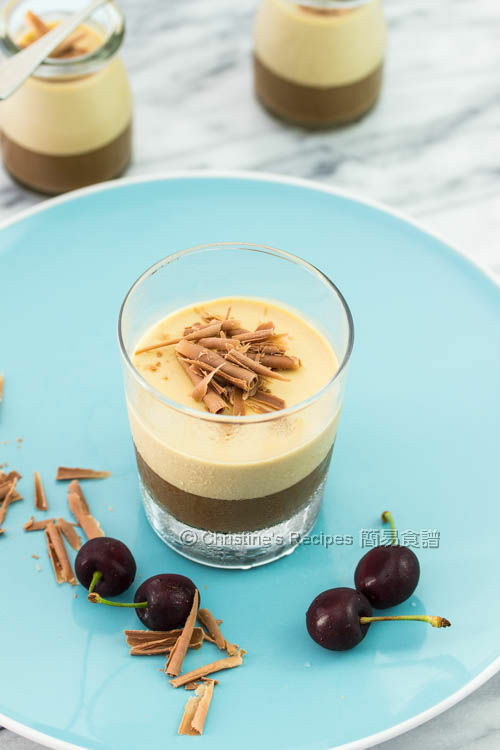 After having made the green tea panna cotta and posted on my Chinese blog, a reader asked what else could be used if not using green tea powder. Having pondered a few seconds, a word "coffee" came up in my mind. I still had the urge to make layered panna cotta without chilling each layer and running back and forth from my fridge. I’d like to make it in one go. Well, the method I used was so simple and straight forward without any fuss and tricks at all. All I had to do was to mix all ingredients well together, then waited patiently for the mixture automatically forming layers itself. After half an hour or so, the two layers of dark and light brown in colour was gradually developing. Why two layers instead of three like the green tea one? The instant coffee powder I used can be dissolved completely without any particles left in the sieve. Thus only two layers could be formed. As for making the green tea panna cotta, I pressed the dark green particles through the sieve that created the darkest green layer at the bottom. If you like it with one layer, simply chill the dessert in fridge after a brief cooling time. 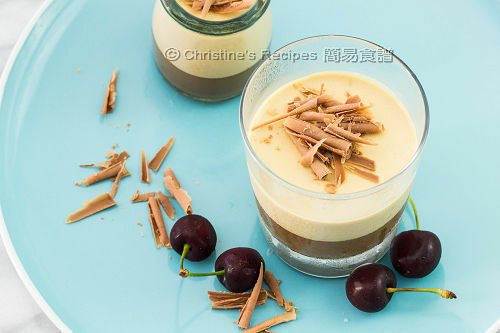 No matter how many layers, this creamy, silky smooth dessert with coffee aroma is perfect for wrapping up a dinner or well prepared ahead for any celebration occasions. The two layers formed themselves after leaving for 30 mins before chilling. Measure out 2 tablespoons of milk from the recipe and mix with the gelatine powder. Let it sit until softened. Take out another 3 tablespoons of milk to combine with coffee powder. Set aside. 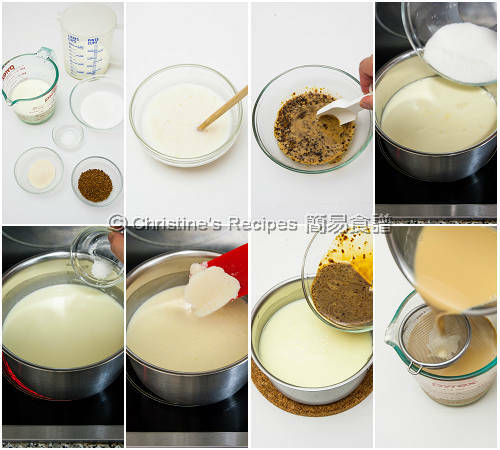 Use a sauce pan to heat the remaining milk, whipping cream, sugar and salt over medium heat until sugar dissolved. Stir in the gelatine. Make sure to dissolve it completely. Remove from heat. Pour in the coffee mixture and stir to combine well. Drain through a fine sieve. Pour into the cups and jars. Let them sit for 30 minutes, or until two layers are formed. Chill in fridge for at least 3 hours. Serve with shaved milk chocolate on top with cherries. If the coffee powder is too fine, you hardly get layers . Try to get the ones with coarse coffee granules. If you don’t want two layers, you can transfer the panna cotta into the fridge once they cool down a bit. Hi Christine, can I substitute the coffee powder with cocoa powder? Yes, why not? The taste will definitely be great too. But not sure how the layers will turn to be like as I haven't experimented it yet. So beautiful! And I love the layers! 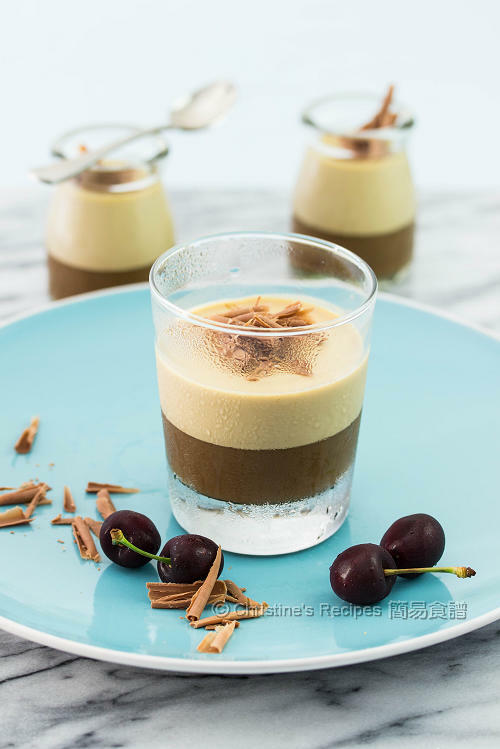 I am so craving a panna cotta right now after seeing this delicious post! I used Ward's gelatine powder. Got it from supermarket. The gelatine is not easily dissolved. Soak it with a bit of water first, then you can mix in the milk mixture, heat over a warm stove, stir consistency until it dissolves completely. What coffee powder you use? Mine isn't so dark on the bottom layer like yours. I just used a not-so-expensive brand, called Alcafe (classic gold). You might try another brand if you can't find mine. Hi Christine, happy new year. It could be that the coffee powder you used was too fine, so it couldn't sit at the bottom. is it instant coffee? or espresso coffee? Either can do. It should be pure coffee powder. Don't use those mixed with milk powder and sugar inside. can i substitute the whipping cream with milk? The whipping cream is to add more milky and creamy flavour. Sure, you can replace it with milk. What brand of whipping cream do you use? I used Paul's, a brand available in Australia. I loved your recipe and can't wait to try it. I wanted to know did you whip the cream and use or did you use it without whipping? No, you don't need to whip the cream. Just warm it up with milk to dissolve the sugar. Look stunning. Thanks for your recipe.